Horizontal air flow, ideal for shelf drying of numerous samples, or any other heat processing of parts at temperatures to 7500F. Oven size conveniently accommodates ma- terials handling equipment. Choice of either combination or full horizontal air flow in either rear or top mounted heat chamber configurations. Designed and constructed for long, hard, continuous use. Standard walk-in ovens meet the require- ments of National Fire Protection Associa- tion Standard 86, Industrial Risk Insurers, Factory Mutual and OSHA standards. For some applications, such as those involving flammable solvents or hazardous locations, the above organizations require additional safety devices. Best suited for drying material on shelves. Heated air is blown horizontally across the work space be- tween full coverage duct work. For shelf truck load- ing applications with densely loaded shelves, solid bottom trays, or flat sheets where heated air can only pass sideways above and below each level. Also used for heating stacks of plates, separated by spacers, placed on oven floor or loaded on a flat bed truck. Operates on 208 volts, 3-phase, 60 Hz or 230 volts, 3-phase, 60 Hz (Standard) or 460 volts, 3- phase, 60 Hz and 380 V/3 Ph/50 Hz. Other electrical characteristics available. Aluminized steel interior. Carbon steel structural members and steel plate painted with high tem- perature aluminum paint. Trilite Green enamel painted aluminized steel exterior. Two air flow pat- terns available Combination air flow for random shapes and sizes or for large bulky objects where heated air can move upward, around and through the load. Horizontal air flow for applications where heated air must move sideways to pass through a load such as trays or flat sheets. 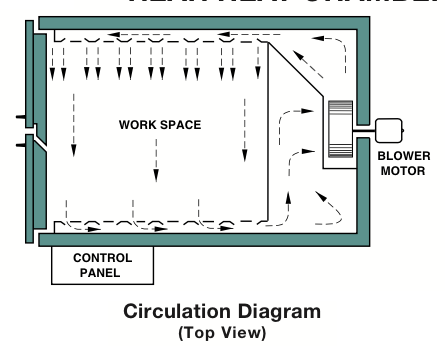 See circulation diagrams below. Two oven configurations available Rear heat chamber for easy han- dling, low profile equipment. 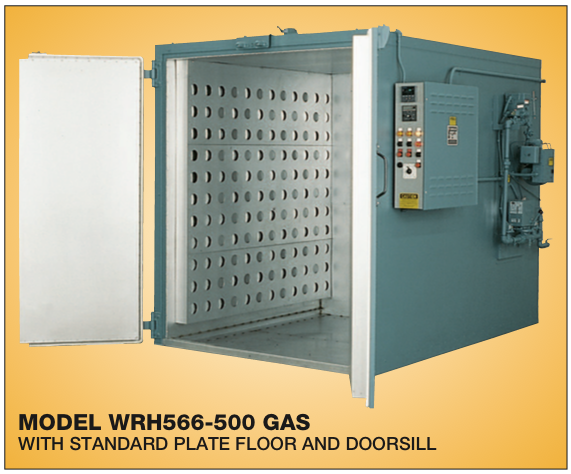 Top mounted heat chamber to minimize factory floor space occupied or to allow installation of doors at each end. Doors on front and rear allow for pass through operation or for loading from both ends. 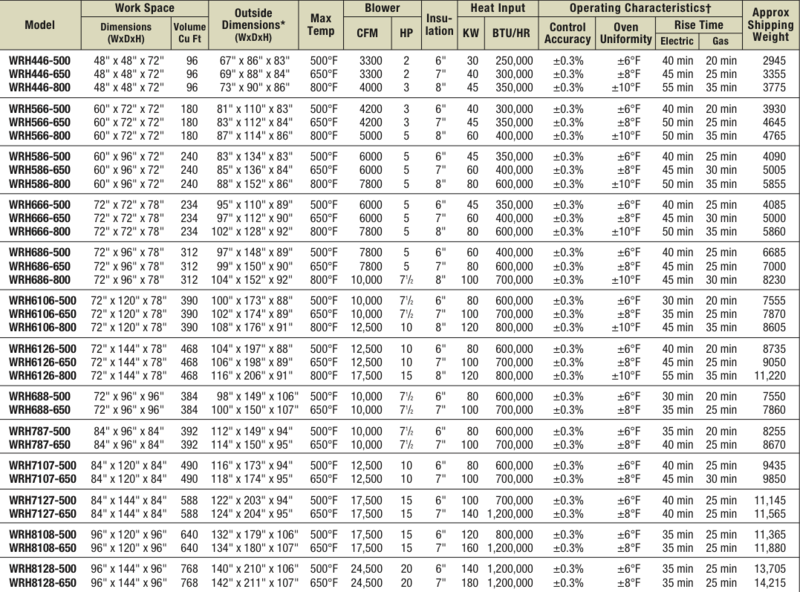 See Table on following pages for detailed specifications for each size oven.